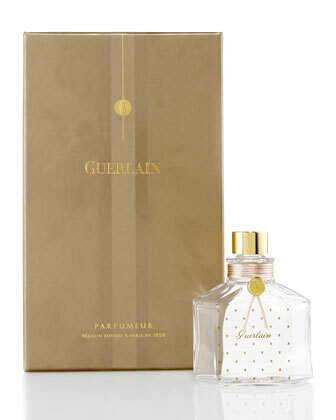 When you purchase a Customized Bottle from Guerlain, you can have your favorite fragrance in its own special bottle along with a personal message written on the front. If you choose the Prestige Atomizer, it is sold empty, along with a funnel, your bottle can be filled with either Shalimar, Jicky, L'Heure Bleue, Mitsouko, L'Instant de Guerlain or Samsara perfume. This is a wonderful option for those who buy large bottle and need to transfer them into a more practical format. .
You can customize your bottle with an atomizer bulb and a ribbon which would be tied around the neck in colors of beige, blue, gold, brown, khaki, black or pink. The border around the label can either be in a classical, Victorian, Byzantine or Art Deco design. You could also choose the iconic Bee Bottle in three sizes: 250ml, 500ml and 1 liter. Each of the bees and scale motifs are picked out in rich gilded enamel. 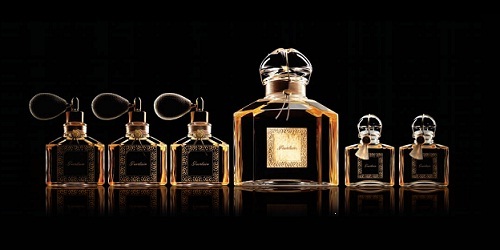 Your choice of fragrances are: Jicky, Shalimar, Mitsouko, L'Instant de Guerlain, L'Heure Bleue and Samsara. For information, contact Isabelle Rousseau: irousseau@guerlain.fr at the Paris office. Ebay Find! Limited Edition Moscow Perfume!